I am a lover of most things lemon, or most things citrus for that matter. I mean, what vegetable isn’t improved with a squeeze of lemon? And pastas? Salads? Soups? Fruity things? 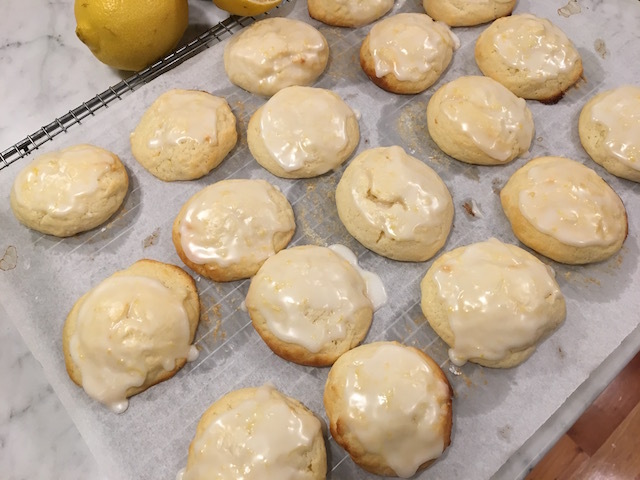 So when I spotted a recipe for lemon ricotta cookies, I investigated further. 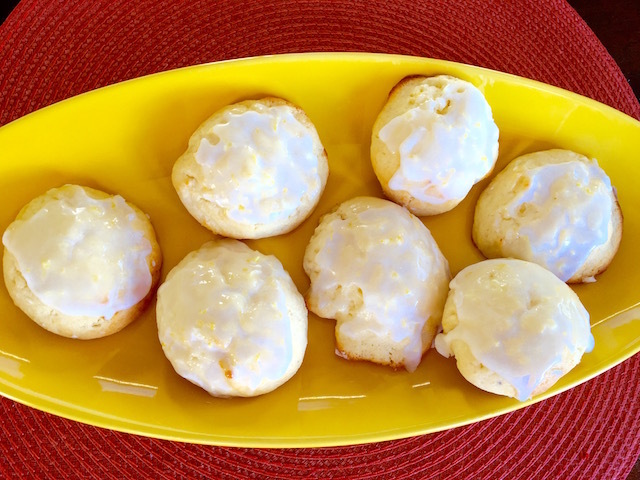 This highly touted recipe for lemon cookies began with Giada over at Food Networks. Right off the bat I could tell that Giada, as cute and peppy as she appears, is not a cook like me. Who would want to battle with mushy batter for cookies? The cookies spread out and weren’t attractive in my eyes. And why would she show a quart sized container of ricotta cheese? I could tell from looking at the recipe that her original formula would be way too sweet for my taste – especially when I thought of eating them with coffee in the morning (in my humble opinion there is nothing wrong with cookies for breakfast). And so, before I even started, I began conjuring my version of these cookies and am happy to report that they turned out to my liking. And to the liking of my son and my grandson and my daughter. I would not call these little lemon-infused desserts cookies or cakes, but rather a hybrid of the two. They are mixed together like cookies but have the texture of cake, or even a scone of sorts. Cooled and glazed and ready to eat! Why, I ask myself, isn’t the Food Network hiring me, a 66-year old grandma who loves to cook, to be on TV and talk up my recipes? Well, the answer is that most viewers would rather look at cute little Giada. What a pity. Preheat oven to 375 with rack in the middle (I used my convection setting at 350 and put the three racks in there at the same time – one middle, one four inches above and one four inches below). Line three cookie sheets with parchment paper. In a medium bowl, combine the bread flour, salt and baking soda. In a large bowl, cream the butter with the sugar on medium to high speed for four minutes. Add the eggs and mix in well. Add the ricotta, lemon zest, lemon juice, and lemon extract and mix again. Stir in the flour mixture until just combined – do not over mix. Refrigerate the dough for at least two hours or even overnight. Scoop about 2-3 tablespoons of dough per cookie (my scoop said #30) onto the parchment covered cookie sheets – I made 12 cookies per sheet. Bake 15 minutes for a single sheet in a regular oven at 375 degrees until the edges are slightly brownish. Remember, I baked all three sheets of cookies together on convection 350 for 15 minutes. Remove from the oven and put the sheets onto cooling racks – you don’t need to transfer the cookies at all (Giada, please note this). While the cookies are baking, make the glaze by stirring the ingredients together. The consistency is a little thicker than maple syrup. When the cookies are cool to the touch slide the parchment with the cookies off of the trays for easy cleanup (Giada, please note this too). Any frosting that drips off the cookie will end up on parchment! And just so you know, I lick any frosting drips. Put about one teaspoon of glaze on each cookie and skim it over the entire top with a knife or the back of a spoon. Let the frosting harden – this took me about one hour maximum. Pack into a cute container and eat or gift them. I did freeze these but when defrosted the frosting became tacky. Wait a bit and the icing hardens, so I would still freeze them and I imagine they would keep for at least a month frozen. HAHAHA, you’ll never have them around that long. This entry was posted in Cookies and tagged coocakes, Cookies, lemon, triple. Bookmark the permalink.